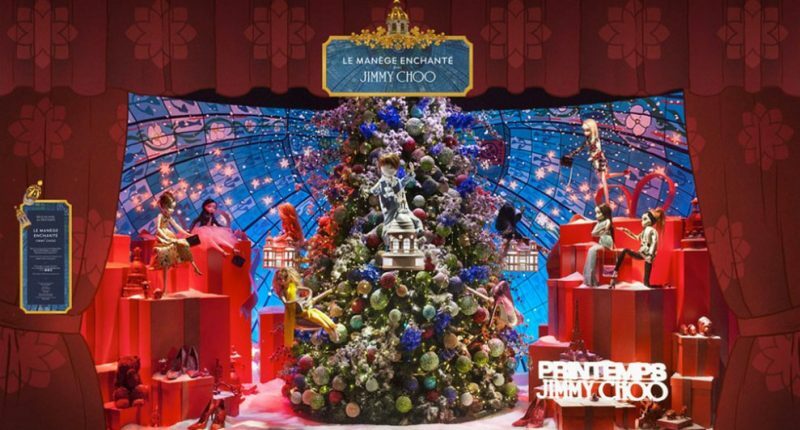 The ultimate shopping destination in the French capital celebrates the festive season with the unveiling of Jimmy Choo themed Christams windows. American actress Uma Thurman has inaugurated the enchanting Christmas window display at the Printemps department store on boulevard Haussmann, which features a revolving Christmas tree adorned with Jimmy Choo shoes and dolls. For the 2016, “Christmas Dream at Printemps” windows tells the story of a magical and enchanting journey of two sleeping children suddenly waking up in their dream, right in the heart of the Parisian department store. Each window display presents a magical tableau of one of the marvelous stages of this dreamlike voyage featuring adorable characters that have been designed and produced in collaboration with the Choo-girls; fashionistas with an irresistible appeal by Jimmy Choo; Sybil and David Yurman, founders of the eponymous brand accompanied by the Magic Stones, colorful animal musicians and Cerise, the heroine who embodies Bonpoint.